Wedding Cupcakes are still enormously popular and we have some new exciting designs on offer for 2010. 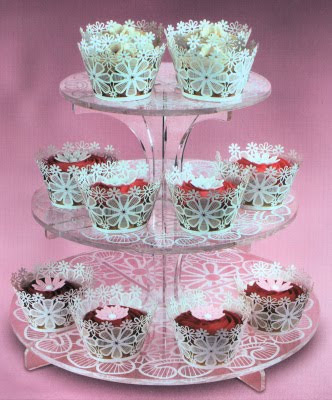 These lovely little cakes in delicate lacey wraps are sure to prove a big hit for summer Weddings. We'll be taking cup cakes and some other new Wedding Cake ideas along to The George Hotel Wedding Fayre in Edinburgh on Sunday 21st. February so be sure to attend! The show starts at 1pm with drinks and canapes and a wide range of exhibitors. The wedding team at The George will be on hand to answer all your questions, with Hotel tours and a prize draw so it should be a super event. We hope to see you there!